[FREE IRAN Project] In The Spirit Of Cyrus The Great :: View topic - British Foreign Office Tried to Coverup Iran Terrorism ! British Foreign Office Tried to Coverup Iran Terrorism ! Posted: Fri Oct 07, 2005 10:24 am Post subject: British Foreign Office Tried to Coverup Iran Terrorism ! The British Foreign Office are Accomplices in Terrorism !!! The Foreign Office has spent a lot of energy over the past few days trying to play down a story reported in The Sunday Times two weeks ago and repeated by a senior British official in remarkably candid terms on Wednesday. The official cannot be named under the conditions of the "background briefing" he gave to reporters at the Foreign Office. But it can certainly be said that he was in a position to know a great deal about what was going on in Iraq. He was asked whether it was true that Iran was supplying the Shia militias with roadside bombs triggered by infra-red tripwires, just like those used to protect valuable items in museums or banks, bombs that have killed six British soldiers in southern Iraq over the past few months. The Foreign Office, which has carefully fostered its links to Tehran, was aghast when the official not only confirmed this was true but went on to accuse the Iranian Revolutionary Guards Corps of smuggling them across the border into Iraq. The problem was that, as Tony Blair was forced to admit yesterday, British intelligence officials are as sure as they could be that this is going on but have no categorical evidence to prove it. Suspicions were first alerted in mid-July when three British soldiers were killed by a new type of roadside bomb. It bore all the hallmarks of devices used previously by Hezbollah who obtained them from Iran. As The Sunday Times reported two weeks ago, the SAS was sent to Basra to track the bombs as they crossed the border, leading to the arrest of two militiaman suspected of involvement, and the furore over last month�s rescue of two SAS soldiers held by the militia as bargaining chips. The Foreign Office might have its concerns that The Sunday Times report was confirmed in such a forceful way but with six British soldiers and two UK contractors killed by the bombs, and the UK mission in the south seriously damaged, Mr Blair�s words of warning arguably came far too late. Posted: Sat Oct 08, 2005 1:15 pm Post subject: not surprised. were Americans surprised? I mean when they left the brits and the shiet alone right along the IRI borders! guess they have been surprised everyday, since! the brit forces were always reported as "turning a blind eye" to IRI activities in Iraq. what Americans are yet to find out is that it was all planned, and that was the very reason brits had asked to take over iran's borders! they had already established one LUCRATIVE ISLAMIC REPUBLIC in Iran, and they had all the intentions, motives and plans in place to create another SHIET majority Islamic Republic in Iraq. and they have! thanks to your naive blind trust on them. hey anyone seen the BBC report that tries to make fun of Bush and perhaps suggest he's got psychological problems and is not a fit leader? the one that suggested P. Bush said that he hears the voice of God telling him what to do. and they thought their worst enemies are from Middle East and Brits are their best allies (?) !!! let me see this must be a response to the lecture president Bush gave later on! the war manifesto as some call it. Brits must be very angry that their baby the IRI is threatened by attacks. funny thing is how stupid their reactions are. Especially the stupid BBC framing Bush for talking to God , while they have the record of praising ayatollah Khomeini the Mad Man for being such a great man of God! I guess allah's merceneries are welcome by the Brits, but Jesus is not. LONDON -- Despite concern over Iran's nuclear program, Britain continues to approve the export of military and security equipment to the Islamic republic. Officials said the government of Prime Minister Tony Blair has approved the sale of non-lethal military and security equipment to Iran. They said the exports were approved after Teheran pledged not to use the equipment for the military. "We don't see our concern over the nuclear program as being connected to other Iranian missions which we have seen as vital," a British official said. In mid-September, the government approved an export of body armor for Iranian security forces. Officials said the armor would be supplied to Iranian forces along the border of Afghanistan and Pakistan. According to a report from ISNA, the regime-run student news agency, on Saturday, Oct. 8th at noon, more than 20 unknown thugs attacked the dorms of the Technical and vocational school of Neishabour (province of Khoraasaan), beating and severely injuring a large number of defenseless students, then fleeing. The Dean of the School announced: "On Saturday, a rather large number of unknown individuals carrying knives, machetes and Billy clubs attacked the dormitory, severely beating and injuring the resident students. Five of the students were rushed to the hospital due to the seriousness of their injuries. The assailants fled and so far no one has been arrested." The commander of the disciplinary forces of the Township of Neishabour while confirming the news stated that no one contacted the 110th unit of the disciplinary guards while the attack was taking place and so far, they've found no signs of the attackers. The Technical and Vocational School of Neishabour was established in 1998, offering 8 fields of study, it is able to accommodate 1500 students. 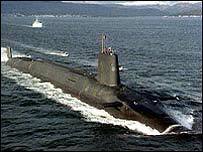 Posted: Tue Oct 11, 2005 10:36 pm Post subject: Trident & Iran ! The future of the UK's Trident missile deterrent could be affected if Iran develops nuclear weapons, Foreign Office Minister Kim Howells has said. Mr Howells said any such development would throw the question of nuclear deterrence "back into the boiling pot". But Iran would not be able to produce nuclear weapons for "some time yet", he added. Trident received a �1bn boost in July to ensure the system is reliable. Mr Howells was speaking as Tory MPs voiced concern over Iran's regime. Mr Howells, responding to a question about the future of Trident, said: "If Iran does develop a nuclear weapon, it throws the whole of the issue about how we get rid of our nuclear stocks, how we demilitarise, back into the boiling pot." The comments came during a Westminster Hall debate suggested by David Amess, Tory MP for Southend West. Mr Amess said the government's policy of "rapprochement" had allowed radical elements in the current Iranian regime to strengthen their control. He added that the regime posed "a real and present threat" to its own and the Iraqi people, citing issues including efforts to export fundamentalism, sponsorship of terrorism and the development of nuclear weapons. Mr Howells said there was "absolutely no explanation" for Iran's programme of nuclear conversion and that there were "very, very worrying things" happening in Iran at the moment. Tory MPs called for an end to the policy of engagement with Iran and said the government should refer it to the UN Security Council over its nuclear activities. However, Kate Hudson, chair of CND, said it was "outrageous" to use Iran as an excuse for proliferation of nuclear arms. "The concern is that this danger of proliferation can be used in a political way. We saw it in Iraq, where the government believed there were weapons," she said. "Many people are concerned that something similar is happening with Iran. "The best way to deal with this is to have all countries comply with the NPT [the Nuclear Non-Proliferation Treaty] and begin disarmament." The debate came after Iran denied being involved in explosions in Iraq which killed eight British soldiers in the last five months. But Prime Minister Tony Blair has warned the regime that it had been linked to recent attacks. Mr Amess expressed concern over Iranian president Mahmud Ahmadi-Nejad, who he said had been accused of being a murderer and a terrorist, as well as plotting to kill author Salman Rushdie. He said the Iranian cabinet was a "who's who of terrorism" and that the rise of Mr Ahmadi-Nejad revealed moderates in the government had been eclipsed. why the h.e.l.l. were they beating up the poor students in Neishapur for? This may be a unique moment in British political history where the Tory's and Labour actually agree on an issue. Safe to say it's high time they had this debate out in the open. All they could do is squeal "Lies!" Point being as well, niether Blair or Straw can be accused by the IRI of using the EU3 nuclear issue as motivation for having made the statement themselves initially....and this is just my gut instinct and logic on why it came out as it did. The British government took the shameful decision to drop its claim that the Iranians had masterminded the Lockerbie bombing that killed 270 people in December 1988, even though British intelligence uncovered significant evidence of Iranian involvement. It was not the outcome the Foreign Office had been planning. When it was announced early last week that a senior British diplomat in Baghdad was flying back to London to give a briefing on Iraq's constitutional referendum, the general expectation in Whitehall was that the following day's headlines would focus exclusively on whether sufficient numbers of Iraqis would turn out to validate the exercise. Imagine the surprise, then, of Jack Straw and his officials the following morning when they opened their newspapers to discover that the future constitutional arrangements for Iraq had been completely superseded by official British confirmation that Iran's Revolutionary Guards were behind the deadly attacks that have recently claimed the lives of eight British soldiers. For the past two years it has been a Foreign Office mantra that not a word should be uttered that could in any way be construed as criticising the Iranian government. Having voiced his last-minute opposition to the invasion of Iraq, Mr Straw had taken it upon himself to find a "negotiated solution" to the West's stand-off with Teheran over its clandestine nuclear programme as an alternative to military confrontation. Indeed, when The Sunday Telegraph two weeks ago revealed that agents working for the Revolutionary Guards had linked up with the Iraqi groups responsible for the attacks on British troops, the Foreign Office continued to insist that there was no firm evidence. But now the cat is out of the bag. Not realising the sensitivity that Mr Straw attaches to Britain's dealings with Teheran, the unfortunate diplomat unwittingly strayed from his referendum brief and started laying into the Iranians with a gusto not seen in the British diplomatic service for decades. The Iranians, said the diplomat, were colluding with Sunni Muslim insurgent groups in southern Iraq. They were providing them with deadly terrorist technology that has been perfected by the Iranian-funded Hizbollah militia in southern Lebanon against the Israeli army. And their motivation was to deter Britain from insisting that Teheran abandon its controversial nuclear programme. "It would be entirely natural that they would want to send a message 'don't mess with us'. It would not be outside the policy parameters of Teheran." This is diplomat-speak for, if Britain wants to confront Iran over its nuclear weapons programme, then Iran feels entitled to blow up young British soldiers. The off-message tone of the unnamed diplomat's comments sent shock-waves through the oak-panelled walls of the Foreign Office. "It was all very amusing," said one official. "For years diplomats have been under strict instructions not to say anything in public that might upset the Iranians. And then someone gives it to them straight between the eyes." Perversely, this undiplomatic bout of straight-talking may turn out to have done Mr Straw and the Foreign Office an enormous favour. By baldly stating what the Iranians are really up to in southern Iraq, the diplomat has freed his employers from the obligation of persisting with the charade of constructive engagement with a regime whose only interest in construction appears to be directed at building an atom bomb. The policy of kowtowing to the Iranians goes back a long way. It started in the late 1980s when Sir Geoffrey Howe, the then foreign secretary, attempted to establish a constructive dialogue with the mullahs in what proved a futile attempt to persuade Teheran to free British hostages in Lebanon. As part of this policy, the British government took the shameful decision to drop its claim that the Iranians had masterminded the Lockerbie bombing that killed 270 people in December 1988, even though British intelligence uncovered significant evidence of Iranian involvement. Fast forward to 2005, and the British Government continues to play the supplicant while Iran continues to do as it pleases. For the past two years, Mr Straw and his French and German colleagues have argued that the best way to persuade the Iranians to give up their nuclear programme is to pursue a "negotiated solution". As the Foreign Secretary insisted earlier this year, it was "inconceivable" that the US and Britain would take military action against Teheran. Mr Straw's pacifist tendencies were music to the mullahs' ears, so much so that they expressed their gratitude by breaking the seals at the Isfahan nuclear processing plant and resumed their uranium enrichment programme. This action alone should have convinced the European negotiators to activate their long-standing threat to report Iran to the Security Council for its persistent failure to cooperate with the requirements of the International Atomic Energy Agency, the UN's nuclear watchdog body. But that was far too confrontational for Foreign Office sensitivities and, at the request of Mohammed ElBaradei, the head of the IAEA, the Europeans gave Iran one last chance to comply. That was in July. Since then, Mahmoud Ahmadinejad, the new Iranian president, has gone out of his way to humiliate both the Europeans and the IAEA. When Ahmadinejad addressed the UN general assembly last month, far from offering a compromise on the nuclear issue, he laid into the US and its allies, including Britain, accusing them of sponsoring terrorism. Mr Straw's response? To reassure the Iranians that the crisis between Iran and the West would "not be resolved by military means, let's be clear about that". And even when the IAEA finally agreed to refer Iran to the security council, the timing and manner of reporting Iran was deliberately left open "to allow room for more negotiation", as one IAEA official explained. Mr ElBaradei's disinclination to make Iran fulfil its international obligations is, of course, one of the reasons that he has been awarded the Nobel peace prize, a decision that will have the mullahs falling about with laughter in Teheran this weekend. This, after all, was the same ElBaradei who said he had no evidence that Libya was building an atom bomb until Colonel Gaddafi saw the light after the Iraq war and publicly renounced his nuclear weapons programme. Certainly, the longer the West prevaricates over Iran, the more inclined the Iranians are to think they can get their way by resorting to the tactics of the bully. The Iranians clearly do not share Mr Straw's aversion to military action: the moment we try to call them to account, they kill and maim our soldiers in southern Iraq. With the help of last week's unscripted remarks by that diplomat, Britain and its European allies should face up to the reality of dealing with modern Iran and accept that their policy of appeasement towards the mullahs now lies in shreds. � Michael Rubin, a resident scholar at the American Enterprise Institute in Washington, is the editor of the Middle East Quarterly. London, Oct. 12 � Members of Britain�s House of Commons from the country�s three major political parties took turns to lambaste Iran�s hard-line President Mahmoud Ahmadinejad and his government in a lively parliamentary debate, according to a transcript of their debate posted on the United Kingdom Parliament website. Conservative Member of Parliament David Amess, who initiated the debate, described Ahmadinejad as a �hostage taker, murderer and terrorist� and his cabinet as �the Who�s Who of terrorism�. �Ahmadinejad was a ringleader of the takeover of the United States embassy in Tehran just after the 1979 revolution. He is accused of plotting to murder Salman Rushdie, of interrogating, torturing and executing Iranian dissidents during his time with the Islamic Revolutionary Guards' [Corps] internal security brigade, and of terrorist assassinations around the world when he was a key figure in the formation of the Islamic Revolutionary Guards' Jerusalem force�, Amess said. Chris Bryant, from Tony Blair�s ruling Labour Party, highlighted human rights abuses in Iran. �Thirty juvenile offenders are currently on death row in Iran�, Bryant said, adding that Iran continues to execute children under the age of 18 despite having ratified international conventions against the practice. Speaking for the Liberal Democrats, Nick Clegg told his fellow MPs that Iran was posing a major challenge to Western policymakers, as human rights abuses continued unchecked, Iranian influence in Iraq seemed to be growing day by day, and so did the threat of escalating nuclear proliferation in Iran and, therefore, the region as a whole. Conservative MP Bob Spink, who recently returned from a visit to Iraq, said, �Senior politicians there are deeply concerned about Iran's wish to stop democracy and stability developing in Iraq and particularly in Kurdistan, where excellent progress has been made since the war. Senior Iraqi politicians told me that they believe sincerely that Iran's nuclear programme is continuing and most certainly with a military objective�. Fellow MP Julian Lewis warned of a danger that Tehran could develop nuclear weapons and supply them �to non-state actors that would have no hesitation about using them for terrorist purposes�. Labour MP Andrew Mackinlay, a member of the Select Committee on Foreign Affairs, asked the Minister if the British government would give assurances about the safety of several thousand Iranian dissidents in Camp Ashraf, Iraq. The Foreign Office Minister for the Middle East, Kim Howells, said their safety was assured. Conservative MP Brian Binley warned that the Iranian regime had a direct impact on the UK. �Only last week the Foreign Office officially confirmed that Iran's Revolutionary Guards Corps was behind the deadly attacks that recently claimed the lives of eight British soldiers. � Also last week a member of the British diplomatic service said that the Iranians were colluding with the Sunni Muslim insurgent groups in southern Iraq and were providing them with the deadly terrorist technology perfected by Iranian-funded Hezbollah militia in southern Lebanon. This does impact on us�. David Amess, who was thanked by his colleagues for initiating the debate, urged the British government to take immediate steps to deal with the opposition Mojahedin-e Khalq (MeK) and remove all restrictions on its activities. �By taking such steps, apart from supporting the Iranian people in their quest for freedom and democracy, our government will be acting in their own interest by defeating the scourge of Islamic fundamentalism and the terrorism emanating from it�. He called on the government to �abandon their policy of engagement vis-�-vis the Iranian regime. Instead, they should adopt a firm policy towards the mullahs, beginning with an active involvement in referring the Iranian regime's nuclear file to the United Nations Security Council without delay. In that way, they can show that they stand with the Iranian people in their struggle for freedom and democracy, and not with the mullahs who oppress them�. Kim Howells, the Foreign Office Minister, said that Iran represented �the great contradiction�, adding that �pretty terrible things� were occurring there and there existed �great dangers for the whole world�. �It is all the more hurtful, in a way, that Iran chooses to snub our approach when we have kept the country, for at least the last two years, from having to face an immediate referral to the United Nations Security Council�, Howells said, referring to the EU policy of �constructive engagement�. �It is foolish for Iran to do that�. On the nuclear front, the minister reiterated, �There is absolutely no explanation for Iran's programme of nuclear conversion and nuclear enrichment, other than that they are building a nuclear bomb�. On Iraq, Howells said that there was �no question that there has been at least Revolutionary Guard involvement there�. �If Iran thinks that it can somehow stymie the efforts of the people of Iraq to create a democracy, it should think again. The world is watching and wants Iran to play a role that is constructive, not destructive�. London, Oct. 12 � Iraq�s former Interior Minister added his voice to a string of Iraqi, American, and British officials in condemning Iranian meddling in Iraq. �Iran�s infiltration in Iraq has increased and Tehran has provided para-military [insurgents] large-scale capabilities�, Falah al-Naqib told the London-based Arabic daily Asharq al-Awsat. �Without any doubt, Iran has a role in attacks against the Iraqi people�, Naqib said, adding, �This country�s infiltration has increased and this is occurring through its large-scale providing of capabilities for certain insurgent groups�. The former Iraqi Interior Minister said that there were either one or several countries that were providing financial support for the insurgency. �Iran�s meddling in Iraq�s internal affairs is very clear and undeniable�, Naqib claimed. He said that Iraqis were well aware of Iran�s activities, adding that the majority of Iraqis, including those in southern Iraq, were suffering from Tehran�s activities. He backed recent comments by Saudi Arabia�s Foreign Minister Prince Saud al-Faisal, who had sharply criticised Iran�s meddling in Iraq. In recent weeks a string of Iraqi figures, including Foreign Minister Hoshyar Zebari and former Defence Minister Hazem al-Shaalan, have accused Iran of meddling in Iraq. Former Iraqi Prime Minister Ayad Allawi recently warned that Tehran's continuing meddling in Iraq�s internal affairs would �damage� both the Islamic Republic and the region. Allawi backed the Saudi position on Iran�s meddling in Iraq, and said, "This meddling [by Iran] will be against Iran and the whole region". The Jordanian government has also given its backing to the Saudi statement on Iran�s meddling in Iraq. The meeting was arranged by Najaf�s Tribal Council and included representatives from the mainly Arab Shiite tribes in central Iraq. The tribal system in Iraq, revived after the collapse of Saddam Hussein�s regime, is not divided along the country�s religious and sectarian roots. Major tribes have followers among both Arab Shiites and Sunnis and have been holding regular meetings in the past two years. �We denounce and condemn external meddling in domestic Iraqi affairs, particularly from Iran,� the tribal elders said in a statement faxed to the newspaper. It said Iran had penetrated the southern and central parts of the country, working to divide Iraq into autonomous regions on sectarian lines. The charges come amid U.S. and British accusations that Tehran had intensified its presence in southern Iraq. Many Iraqi political factions and government officials had sought refuge in Iran to escape Saddam Hussein�s oppression. Some spent most of their exile in Iran which helped them build their militias. The statement urged tribes across the country to deny �terrorists and saboteurs� any form of assistance and work for the unity and integrity of the country. Iran's Revolutionary Guards are running camps to teach Iraqi rebels how to blow up British troops, it was claimed yesterday. Defence sources say the fanatics are teaching up to 10 insurgents at a time while more Iraqis are trained in terror camps in Lebanon and Syria. One source told the Mirror: "There is evidence there are teaching camps in Iran, Lebanon and maybe Syria. Up to 10 Iraqis at a time are being taught before returning and teaching a further 50 people. "There's also evidence the Iranian Revolutionary Guard Corps is training these people." Up to eight British soldiers have been killed in recent months by roadside bombs - triggered by infra-red technology - believed to have been smuggled in from Iran. Now British forces in Basra have seized two similar unexploded devices and hope they will reveal where the bombs are coming from. Three suicide car bombers killed at least 30 people in Iraq yesterday. Meanwhile, Tony Blair warned Iran that Britain and the world will not allow it to back terrorists and build nuclear weapons.